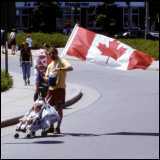 This Internet site is an extensive collection of links to all areas of Canadian culture and Canadiana, organized as a directory using relevant headings. This site introduces itself as follows: "Canadian Information By Subject is an information service developed by the Library and Archives Canada to provide links to information about Canada from Internet resources around the world. The subject arrangement is in the form of a "Subject Tree", based on the structure of the Dewey Decimal Classification system. This service is updated regularly and is constantly developing and expanding. Be sure to check back often to see the latest additions. This site designed by the University of Manitoba describes itself as follows: "The Canadian Literature Archive has been online since October 4, 1994 and is a repository for information about Canadian writers, novelists, poets, playwrights, essayists, Canadian literary organizations, magazines, publications, texts and library archives. It is a project of the English Department of the University of Manitoba. This archive is intended to be a collection of materials for the study of Canadian literature."